Pulsating and cosmopolitan, exclusive and relaxed, or a secluded and romantic private beach with stunning sunset ocean views? With so many locations, cozy bays and stunning coves which offer all the above settings the most important question to answer is which will be the best beaches to stay in Koh Samui for me? Even before you start browsing through the images of hotels it will be wise to do a little research and once armed with useful information make an informed decision on where to base yourself. The good news is that the island is not as enormous as Phuket and travel time between locations much less. It is therefore possible to stay outside the mainstream crowds, even in a quiet location and still be able to access entertainment venues or the rocking nightlife scene in places like Chaweng or Lamai within a few minutes. Below we share information about the primary tourist areas we trust will be useful in deciding which is the best area for you. Please also use our Koh Samui map as a source of reference. Big Buddha and Bangrak featuring the ferry pier to Koh Phangan is located on the north-east shore of the island, 7 kilometers from busy Chaweng and borders onto Bophut. The village of Bang Rak directly behind Big Buddha gives the area a local feel and offer glimpses of the island's traditional way of life. The area gets its name from the 12 meter Buddha statue that acts as an overlord, sitting atop a small hill on the island of Koh Farn. The island is connected to the mainland by a causeway and is home to a large temple, school, restaurants, coffee shops, tattoo parlors, arts & crafts shops and clothing stalls. 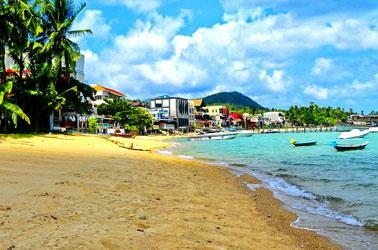 The white sandy bay is approximately 3 Kilometers long, safe for swimming with great views of Koh Phangan. Hotels here are mid-range to cheap budget places, but developing fast. Lately many bars, restaurants, shops and nightlife venues has sprung up and of course you will be near the quaint Fisherman's Village in Bophut. 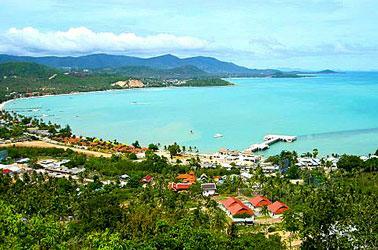 West of Big Buddha on the north coast is Bophut Beach located 10 km from Chaweng where it forms a beautiful white bay. It is an area which recently started drawing more attention from upscale travelers who prefer a quieter option to Lamai and Chaweng, but still wants easy access to entertainment, shops and markets. However, the nightlife of Chaweng is about the only entertainment you might develop a need for, because apart from a heavenly beach, Bophut has ample facilities of its own which include a star attraction in Koh Samui namely the Fisherman's Village. It is an historically important, retains much of its original charms and Chinese influences and feature an abundance of shops, beer bars and restaurants. Add to this our list of the best hotels in Bo Phut like Anantara, Hansar, Deva Samui and the romantic Zazen Resort and you will find Bophut one of, if not the best place to stay outside the mulling crowds.